Hello! I decided to make one more quick card because I saw the Midnight Madness Challenge#26 was open until midnight : ) This was a fun layout! I used Apple Emma for my image, but I wish I would have added some sponging or something. I definitely will next time! Thank you so much for stopping by....again! Very cute card, Kerri! Your coloring is amazing! Too cute Kerri, great job on that MMSC! I had a time with it, but yours makes it look easy! What an adorable image lil Emma is....great coloring job too girl! AWWWW Kerri this is soooo super CUTE!!! I just LOVE your coloring and this image is darling!!! Another fantastic and adorable card sweetie!!! LOVE LOVE LOVE this Kerri! Your coloring is totally awesome and I LOVE the layout and papers you used!! You have such a knack for putting the perfect colors and embellishments together. Everything works so well together! I love the ribbon and button in the corner. What a cute image. I love the red too. I need to start working with more red. Thanks for the inspirations and of course for playing the Midnight Madness sketch challenges. Awww what a sweet cutie patootie Emma is. I love your nice bright colors. It makes this so cheerful and uplifting. Thanks for playing along with us at Midnight Madness. We enjoy seeing your lovely work. Kerri, what a darling image you have here and you've colored her just perfectly. I love the red and white and it shows off your little Emma so well. Fabulous job on the sketch this week. Thanks so much for playing along with us. What a darling image! Love your colors and the ribbons and embellishments. Great job!! Oh, that little girl is a love. Great image and coloring and love the apples for the fall. Thanks for joining us this week at Midnight Madness, hope you will join us again. 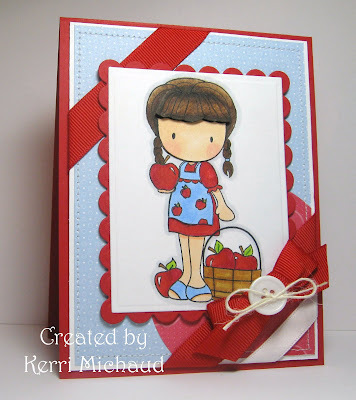 Hi Kerri - I am so glad you found the time to 'squeeze in' acard! I love the way you have used the sketch! Your colours are gorgeous and look fabulos with that adroable image!! Well played! Thank you for playing along with the Midnight Madness Sketch Challenge, I look forward to seeing what you will next week!! Cute image and love the layers of her hair! What a cute and happy card! Love your image and all of the apples. Thanks so much for joining us this week on the MMSC! Great take on the sketch challenge.